For better type-setting and Devanagari rendering use PDF version. Several sub-schools of the Taittirīya school of the Kṛṣṇayajurveda possess their own collections of mantra-s distinct from their saṃhitā-s known as the mantra-pāṭha-s. These include mantra-s that are often found in other traditions but not in their own saṃhitā or brāhmaṇa. Additionally, they also include some mantra-s which are unique to these mantra-pāṭha-s. For example the famous Yajurvedic version of the Śrīsūkta is found in the mantra-pāṭha of Bodhāyana. However, most practitioners in South India do not correctly use the accents of this sūkta and seem to be unaware that the KYV version of this sūkta occurs in this text. The mantra-paṭha-s of the Āpastamba, Bodhāyana, Vaikhānasa and Hiraṇyakeśin sub-schools have come down to us. The mantra-s in them are typically deployed in gṛhya rituals directed by instructions from their gṛhyasūtra-s. However, the Vaikhānasa-mantra-pāṭha is distinctive in having a late terminal part that is used in the iconic worship of Viṣṇu by the Vaikhānasa-s. The Hiraṇyakeśī-mantra-pāṭha has a ṛk-saṃhitā as part of it and is used by the Hiraṇyakeśīn-s of Maharashtra and Tamil Nadu in their rituals to this date. In someways this is reminiscent of the hautra-pariśiṣṭha of the Āpastamba-s that is used by Yajurvedin-s to supplement the role normally performed by the Ṛgvedin hotṛ. Other than these mantra-pāṭha-s of the KYV, we also have comparable supplementary mantra-collections among the Sāmavedin-s in their Mantrabrāhmaṇa and the famous khila of the RV. Further, beyond the Taittirīya school, the Kaṭha school, which was once widespread in the northern parts of the subcontinent like Kashmir and the Panjab, had it own mantra-paṭha that went along with their gṛhyasūtra, namely that of Laugākṣi. While the original form of this mantra-paṭha does not survive to my knowledge, a version of it with accretions of tāntrika and paurānika material used in smārta practice by the brāhmaṇa-s of Kashmir and some of their counterparts in Himachal Pradesh has come down to us. This text was published by the Kashmirian brāhmaṇa-s Keśava Bhaṭṭa and Kāśīnātha-śarman in the first half of the 1900s. I had earlier examined a defective version of this text but thanks to the massive text-scanning effort of the eGangotri Trust of the texts at the Kashmir Research Institute, Srinagar we can now examine a better version of this text. The melding of tāntrika and vaidika tradition found in this Kashmirian text has a long history in Hindu tradition. Indeed, as we have pointed out before[footnote 1], a small mantra-saṃhitā comparable to the mantra-pāṭha-s is found preserved in the śākta-purāṇa, the Devī-purāṇa, which might preserve a distinct vaidika tradition. Similarly, the Āṅgirasakalpa of the Paippalāda school of the Atharvaveda preserves a combined mantra-deployment of Paippalāda AV mantra-s along with tāntrika-vidyā-s. With regard to the AV tradition one may also point to the Tripurārṇava-tantra, an authoritative mūla-tantra of the Śrīkula tradition. The taraṃga of this text preserves a combined tāntrika-vaidika mantra-deployment for the Indramahotsva (the great festival of Indra) which associates itself the AV. This association is likely genuine for the AV is the one vaidika tradition that has clear injunctions for the Indramahotsva in its pariśiṣṭha-s. This section of the Tripurārṇava-tantra specifies several vaidika mantra-s that are to be used in the worship of Indra and other deva-s, which are combined with the worship of the Bhairava of the Śrīkula tradition under the tāntrika scheme. For us auspicious Agni when he is made an offering, the auspicious gift, the auspicious ritual, you the giver of good luck, [for us] auspicious hymns of praise. Another comparable word is svasti (“well-being”) used in a similar sense by the Atri-s in their vaiśvadeva-sūkta, RV5.51.11-15 and also by Gotama Rāhūgaṇa in RV1.89. Indeed, in the Kashmirian tradition the Bhadrasūkta is used on conjunction with RV1.89 and RV5.51.11-15. This style continues into the epic period where we observe Kausalyā confer a blessing on Rāma using a comparable incantation with svasti ( in R2.25). The pantheon of the Bhadrasūkta is entirely Vedic with no paurāṇika features. This squarely places the sūkta within the classic vaidika tradition and it was perhaps even originally attached to some now lost saṃhitā. However, in ṛk-2 we encounter the god Prajāpati. He is not found in the comparable RV7.35 or other core RV vaiśvadeva-sūkta-s. He appears to have entered the Vedic tradition relatively late from a para-Vedic tradition [footnote 2]. His position in the sūkta suggests that he has not superseded the old aindra system as it happened in the even later Vedic layers. In this regard his position is comparable to that found the camaka-praśna of the Yajurveda tradition. This suggests that the sūkta indeed belongs to a comparable relative temporal layer and was a relatively late composition with the Vedic tradition, perhaps consciously mirroring the RV7.35 and RV1.89. The final ṛk has the refrain: “tanno mitro varuṇo mā mahantām aditiḥ sindhuḥ pṛthivī uta dyauḥ” (Mitra and Varuṇa, Aditi, the river, the Earth and also Heaven should grant this to us), which is characteristic of the Kutsa-s of the RV (e.g. RV1.94). Kutsa also has a certain predilection for composing low complexity sūkta-s, which is also seen rather plainly in this one. Importantly, his two vaiśvadeva-sūkta-s, RV1.105 and RV1.106, have characteristic low-complexity style with repetition. Notably, his sūkta to the Sun (RV1.115) uses the word bhadra repeatedly as in this sūkta. Together, these indicate that the composer of the Bhadrasūkta was a member of the Kautsa clan. 1. Venas is implored to be ever-desirous (uśan…sadā) of the worshiper. This furnishes a link between Venas and the later name of Venus in Sanskrit tradition, Uśanas. Thus, it further strengthens the identification of Venas with Venus and suggests an early IE origin for this planetary name. 2. Mātariśvan is explicitly identified with Vāyu in this sūkta. In the RV Mātariśvan is often mentioned as bringing Agni to the Bhārgava-s and humans at large (evidently from Vivasvat). In RV3.29.11 Viśvāmitra clarifies this identification by stating: “mātariśvā yad amimīta mātari vātasya sargo abhavat sarīmaṇi ||”: [He is called] Mātariśvan when he measures out [the space] in his mother; he became the rush of the wind in flowing out. Thus, we translate Mātariśvan as “he who grows in his mother” meaning “he who grows in the world-womb. 3. In ṛk-10 we seen an invocation of various physiological processes. This is unique for a vaiśvadeva-sūkta and not seen in RV sūkta-s of this type. In this regard it has a flavor more typical of the AV. 4. In ṛk-s 12-14 we encounter a great diversity of devatā-dvandva-s, which is unprecedented in any other vaiśvadeva-sūkta elsewhere in the śruti. The emended text of the sūkta is presented below with an approximate translation. For us the auspicious Agni, well-invoked and abounding in light, the auspicious Indra much-invoked and much-hymned; the auspicious Sun, wide-seeing and wide-ranging, the auspicious Moon keeping an eye [on us] in the battle. For us the auspicious Prajāpati [who] progeny-generated, the auspicious Soma, the purified one [Footnote 3] and the manly yellow one; the auspicious Tvasṭṛ giving wondrous forms [to things]. May the auspicious Dhātṛ show favor to [our] progeny. For us the auspicious Tārkṣya Ariṣṭanemi for the sake of good progeny and for conquering the hostile army by means of battle; the auspicious Vāyu, expanding within the world-womb [footnote 4], the lord of the team of horses. May Venus, the wealth-increaser, be always desirous of us. For us the auspicious Mitra and Varuṇa, and Rudra verily with augmentation, and Ahirbudhnya the protector of the universe; the auspicious guardian of the homestead: may he be the destroyer of illness and the auspicious guardian of the field, ever-full of activity. For us the mighty, all-maker Bṛhaspati, the auspicious foe-scorcher and lord of the ritual; the auspicious falcon, reddish-brown and the friend of the Marut-s [footnote 5]. May the auspicious Vāta [footnote 6] blow medicines towards us. For us the auspicious [horse] Dadhikra, the neighing stallion, the auspicious Parjanya [who] manifoldly shines forth; the auspicious Sarasvat and also Sarasvatī, the auspicious cow and the auspicious Indra, the loud-roarer. For us the auspicious Pūṣaṇ, Savitṛ, Yama and Bhaga, and the auspicious first-born Ekapāt, Aryaman and Manu; the auspicious Viṣṇu, the wide-strider and the manly lion. May indeed the auspicious Vivasvat blow towards us. For us the auspicious Gāyatrī, Kakubh, Uṣṇihā [Footnote 7] and Virāṭ. May Anuṣṭubh, Bṛhatī, Paṅkti each be auspicious to us. For us the auspicious Triṣṭubh, the much-loved Jagati [footnote 8] and the auspicious long meters manifold and of many treasures. For us the the auspicious Rākā, Anumati and friendly Kuhū, auspicious Sinivālī, Aditi, and the firm Earth goddess. For us the auspicious Heaven goddess, the atmosphere giving pleasure, the auspicious horse, and Dakṣa for extending for us [our] lineage. For us the auspicious life-process with a good mind and good speech unmanifest, the auspicious excretory process with the body and the consciousness; indeed may the vision be auspicious and hearing be auspicious for us. For us the auspicious life with autumns, a 100 yet to manifest. For us the auspicious Indra and Agni fostering the Law; for us the auspicious Mitra and Varuṇa maintaining the Laws. May the two auspicious Aśvin-s be cognizant [of us]. For us the auspicious Heaven and Earth benevolent to all. For us the auspicious Indra and Varuṇa, devourers of foes. May Indra and Bṛhaspati be auspicious to us. [For us] auspicious Indra and Viṣṇu who augment [us] during the soma libations. May the auspicious Indra and Soma slay the dasyu in battle. For us the auspicious Agni and Viṣṇu, the ornaments of the gift-distribution. For us the auspicious Agni and Indra, the bulls, the lords of heaven. For us the auspicious Agni and Varuṇa, the ever-mindful ones. May the auspicious Agni and Soma be cognizant of us. For us the auspicious Sun and Moon, the two full of insight. 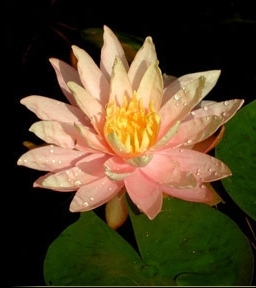 May Soma and Pūṣaṇ be auspicious. [For us] the auspicious Indra and Vayu conquering in battle and the auspicious Sūrya and Agni unconquered and winning wealth. May the auspicious Vasu-s be wealth and progeny [giving]. For us the auspicious Rudra-s who slay Vṛtra and smash the [hostile] forts and the auspicious Āditya-s, well-seeing and well-guiding, and the auspicious kings, the Marut-s, the exuberant ones [footnote 9]. For us the auspicious helper-[gods], well-invoked and with a 100 riches, all the gods and the Manu-s, supporters of the folks. For us the auspicious Sādhya-s, the overpowerers, radiant as the Sun. May the auspicious Ṛbhu-s be gem-givers for us. Auspicious the racers, winners of booty; auspicious the sages, [our] ancestors, the sun-beams. Auspicious the Bhṛgu-s and Aṅgiras-es, the liberal givers; auspicious the Gandharva-s and Apsaras-es, the powerful ones[footnote 10]. For us the auspicious waters, pure and the foremost supporters of all, the auspicious, benign, disease-repulsing herbs; the auspicious cows, charming and invigorating, the auspicious nymphs and loving wives of the gods. May the Saman-s forever be auspicious to us. For us the Atharvaṇ spells, the ṛk-s and the yajuṣ-es. May the auspicious asterisms [be] all benign and [may the] directions, the coordinate lines be auspicious at their conjunction. The years [of the 5 year cycle] and the seasons be gladdening to us, be they productive, easy-going or drought-ridden. May the muhūrta (=48 minutes)-s and kaṣṭa (=3.2 seconds)-s, the directions and the inter-directions be ever-auspicious and [may there be] welfare for the bipeds and quadrupeds. May we see auspiciousness. May we perform auspiciousness. May we speak auspiciousness. May we hear auspiciousness. Mitra and Varuṇa, Aditi, the river, the Earth and also Heaven should grant this to us. atha liṅga-kāmādi-sūtrāṇi vyākhyāsyāmaḥ . jīvasūtrāṇunām anukrameṣu parimeyā vikārā jīvā-paramparāyā+avaśyam . jantvoḥ saṃgrāmas tasya paramaṃ kāraṇam . tasmād ajāyata jīvasūtrāṇunāṃ vyūḍhīkaraṇam . RecA-nāma jīvakāryāṇu-kulaṃ jīvasūtrāṇunāṃ vyūḍhīkaraṇaṃ karoti . mukhyaśo ‘nagnijīvasūtrāṇunām . anagnijīvasūtrāṇu-mithunayor maithunāt . idam eva jantūnāṃ maithunasya rahasyam ..
anābhikānām pranābhikānāṃ ca+ anagnijīvasūtrāṇunām maithunaṃ naimittikā prakriyā . nābhikānām maithunaṃ nirūpitā prakriyā . vyūḍhīkaraṇa-dvirbhāvāt . tasmād ajāyanta liṅgāni . nābhikeṣu bahuśo liṅge dve . kecid bahuliṅgāni pradarśayanti . kyākūni yukta-kāmarūpiṇa romakoṣṭhakāś cety udāharaṇāni . eteṣu liṅga-koṣṭhānām parimāṇa-bhedo bahuśo nāsti . dviliṅgasthitau liṅga-koṣṭhyor parimāṇa-bhedaḥ sadaivodeti (sadaiva udeti) . mahattaro liṅga-koṣṭhaḥ strīti (strī+iti) . sā bahuśas tiṣṭhati . kanīyaḥ pumān iti . sa bahuśo gacchati . liṅgakoṣṭhānāṃ nirmāṇasya dattāṃśa-bhedāj jāyate liṅgayoḥ saṃgrāmaḥ . kiṃ tu paramparā-santatyai viparītayor liṅga-koṣṭhayor ākarṣaṇaḥ saṃgamanaṃ saṃyogaś ca+avaśyam . etaddhi mūla-kāraṇaṃ kāmasya . dattāṃśa-saṃgrāmo ‘karṣaṇaś ca dvayoḥ pratidhrājyoḥ sammelanād dvayor ekaḥ pūrṇaṃ vijayaṃ nāpanoti . tasmāj jāyate ‘nantā spardhā liṅgayoḥ ..
bahukoṣṭha-jantuṣu liṅgakoṣṭhā anyebhyaḥ koṣṭhebhyo bhinnāḥ saṃvṛtāḥ . tasmād viviktā upasthāḥ . udāharaṇāny oṣadhīṣu paśuṣu ca . teṣu viparītānāṃ liṅgakoṣṭhānāṃ sammelanāya vividhā upastha-lakṣaṇāny avartanta . śepo yoniḥ puṣpañ cety udāharaṇāni . paśuṣu trividhā maithuna-vyavasthā . dhṛṣṭa-vratam bahupatnī-vratam ekapatnī-vratam vā . bahupatnī-vratam dvividham . krameṇa bahupatnayaḥ sadyo bahupatnayo vā . pṛṣṭhadaṇḍa-paśuṣu prāyeṇa 25 jīvasūcanāḥ prabhavanty ekapatnī-vratam . Gibbons, orangutans, gorillas, chimpanzees and bonobos te sarve nṛbandhavaḥ . alpa-nṛbandhuṣv ekapatnīvratam bahuśaḥ prakṛtimat . anyeṣu nṛbandhuṣu bahupatnī-vrataṃ ca dhṛṣṭa-vrataṃ ca sāmānyam . mānaveṣu ca . prāyeṇeyaṃ nṛbandhunām mūla-sthitiḥ . strī-balātkāro rakta-nṛbandhunām eko maithunopāyaḥ . rakta-nṛbandhunāṃ vṛṣa-jātir dvividhā . nemivantaś ca+anemivantaḥ . nemivanta ugrā dhunimantaś ca parasparaṃ yudhyante ca . anemivantaḥ śāntāḥ pracchanam maithunaṃ kurvanti ca . bhūriretāḥ pumān nityam bahūn maithunāvakāśān mṛgayate . svāṇḍānāṃ niṣekāya strī su-jīvasūcanā-dhāriṇam puruṣam pratīcchaty anyān nirākaroti ca . tasmād bahuvidhāḥ spardhāś ca pradarśanāni ca ..
manuṣyāṇām prāyeṇa sahajā vyavasthā dhṛṣṭa-vrataṃ ca krameṇa bahupatnī-vrataṃ ca sadyo bahupatnī-vrataṃ ca . lubdhaka-vanagocarāvasthāyāṃ te sarve ‘vartanta . kiṃ tu manuṣyānām upavāsitāyāṃ sthiteḥ prabhūtyās te sarve vaighnakā abhavan . kāsmat? strībhyaḥ parasparam puruṣāṇāṃ naiṣṭhikāt saṃgrāmāt . idaṃ kāraṇaṃ ekapatnī-vratasya+āvaśyakatā dhruvāyopavāsita-jīvanāya . kiṃ tu mānavānāṃ netṛtvam pratibhā sāhasaṃ ca nṛdravyād udiyanti . ataḥ strīniyāna-bhedo nṛṇāṃ svābhāvikaḥ . tasya virodhāt upadravam pravartituṃ śaknoti . paraṃ tu śāntyai dhruvāyopavāsita-jīvanāya ca sarvebhyo puruṣebhyo nyūnātinyūnam eka-patnyā saha vivāham avaśyam . strīṣu vyābhicāriṇī-vratam bhrūṇahatyā +adhipuruṣānudhāvanaṃ cetyādi pravṛttīnāṃ codanāt puruṣa-viṣādo’pi vardhate . ādhunikatā nūtana-kṛtrima-mānava-samājasya nirmāṇaṃ vā tāni sarvāṇi codanti . ataḥ prāyeṇa + ādhunikatāḥ paura-saṃskṛteḥ pratiṣṭhām pratirundhate . yadīdam tatvaṃ tarhi manuṣyāṇām ādhunika-paura-saṃskṛtiś cirāyur nāsti ..
namaḥ somārudrābhyāṃ namaḥ prajāpataye ..
People who are seriously interested in emergent complexity and pattern formation might at some point discover matrix expansion for themselves. 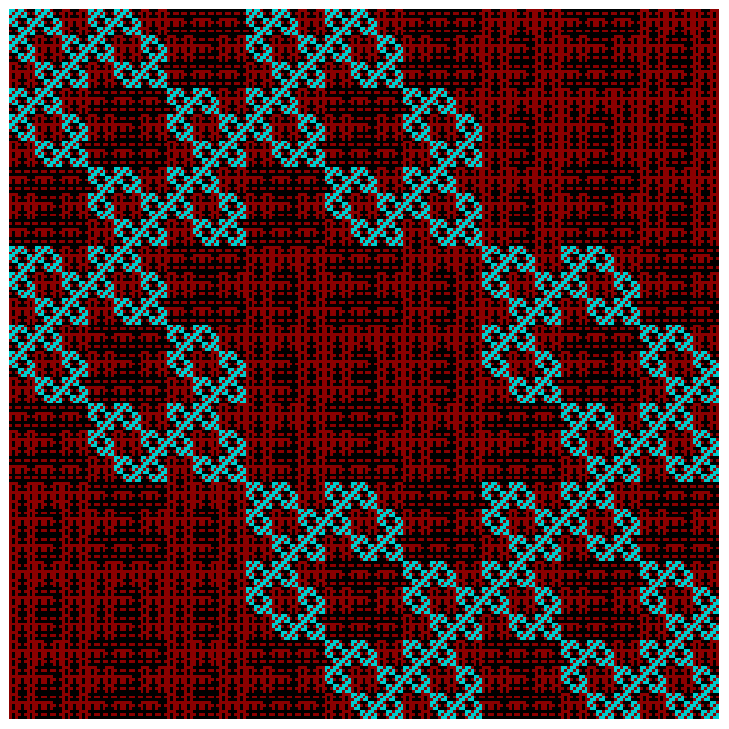 It is a version of string rewriting that allows one to create complex patterns. For me, the inspiration came from the way Hindu temples were constructed in their phase of maturity and this led me to walking on a path, which probably several others have done before me. While matrix substitution is perhaps common knowledge to students of pattern formation, I am still recording it here in part due to the great beauty of the patterns that can be generated by this very simple mechanism. 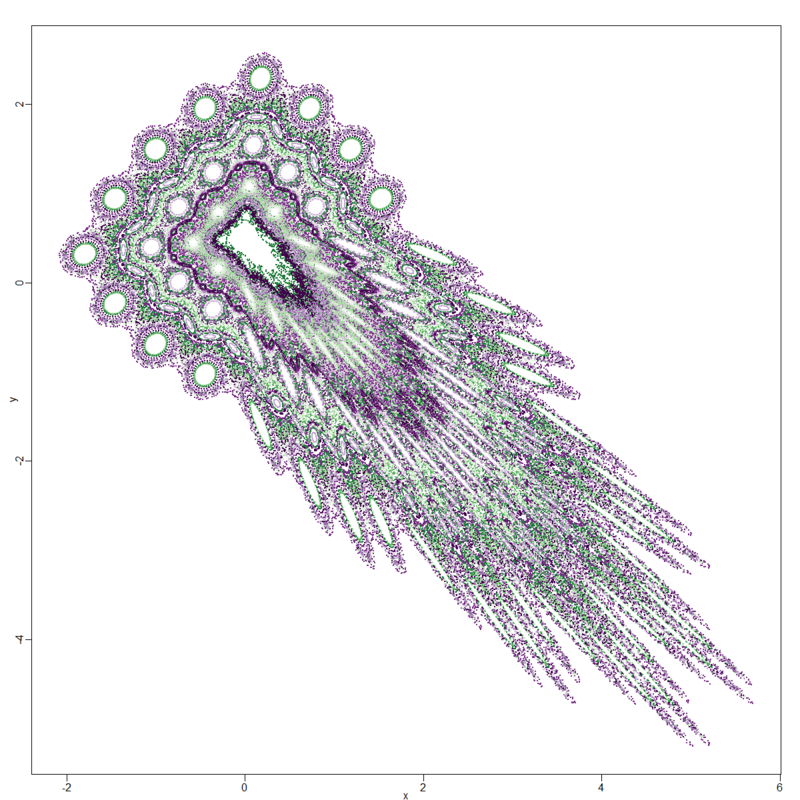 Applying the above rules initialized as indicated above leads us to the famous box fractal (Figure 1). 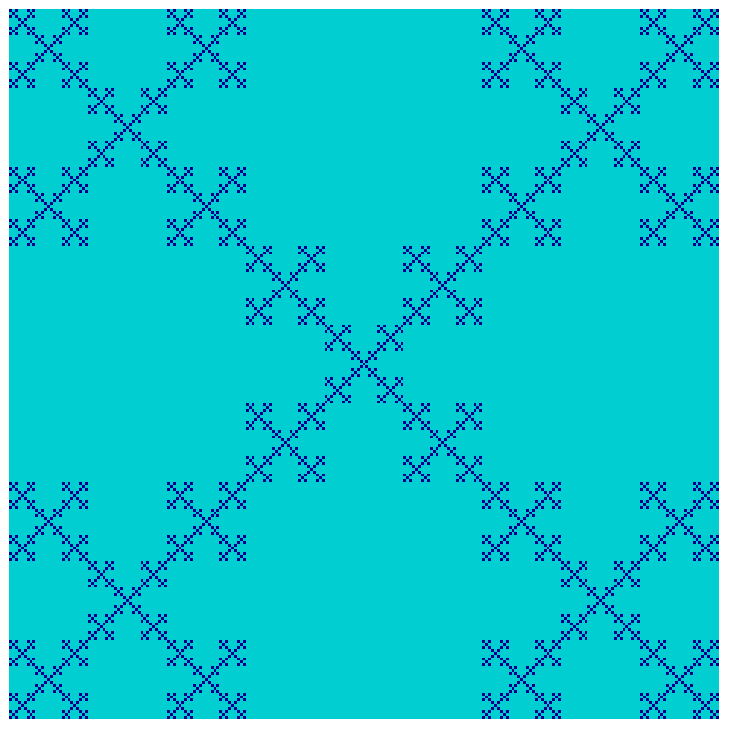 Applying the below rules yields us an interesting carpet weaving (Figure 5). A search on the internet reveals that a certain Jeff Haferman was the first to announce this: in any case he arrived at it before my times. 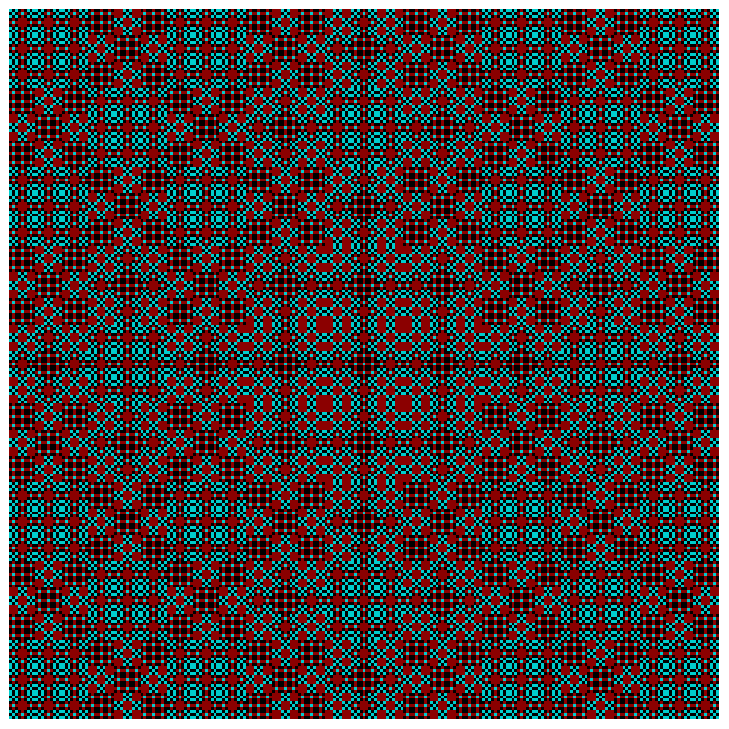 We can get many other weavings; however, to realize the full potential of this mechanism we shall now go to higher number of colors. For 3 colors we need to formulate 3 rules and so on. 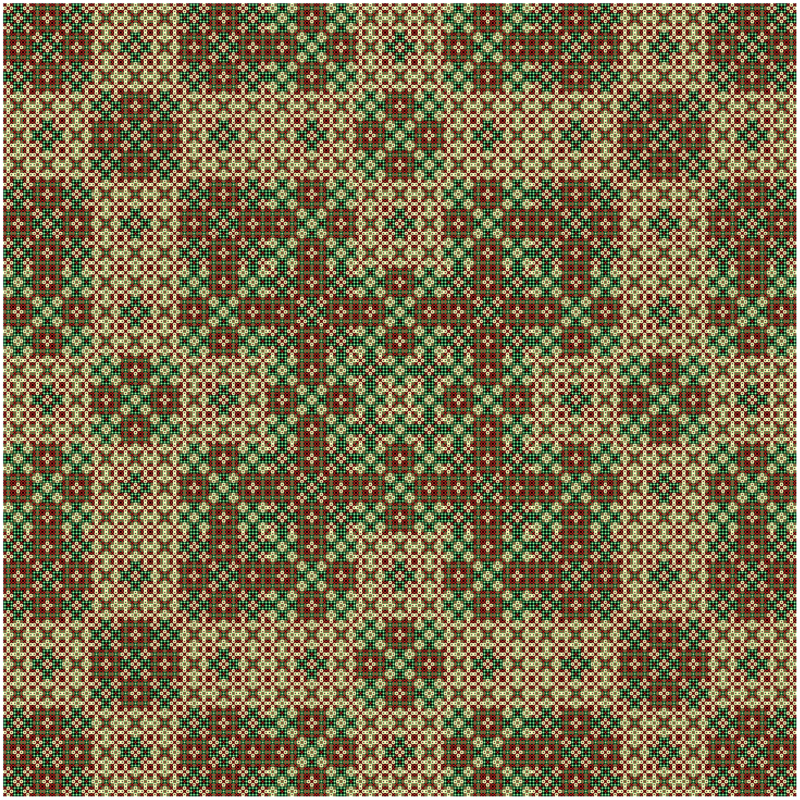 We show below some carpets and fractals obtained with 3 and 4 colors. 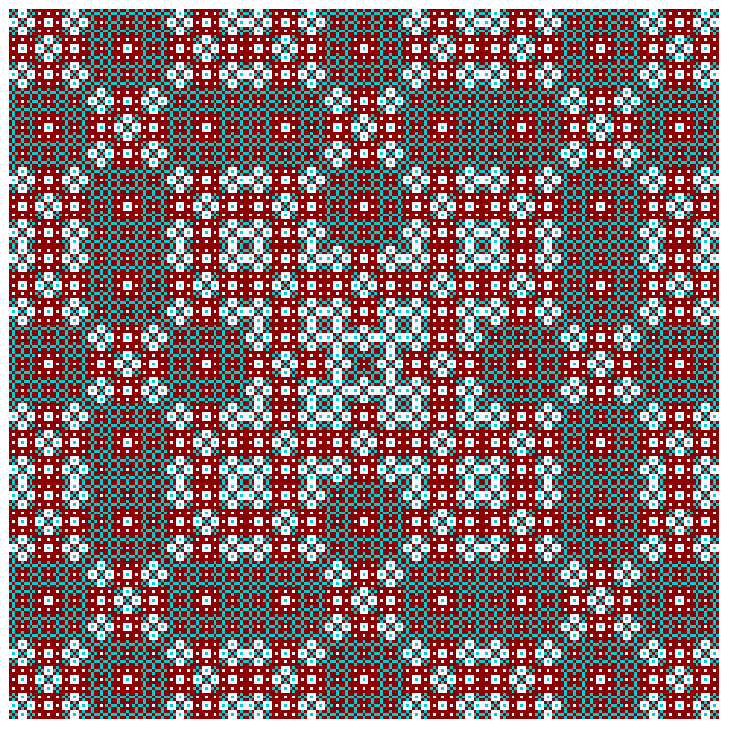 Not all matrices yield aesthetically worthwhile images. A reader might experiment with this method to obtain further images. where is a positive integer 1, 2, 3… For a given , will the above equation have integer solutions and, if yes, what are they and how many? We have heard of accounts of people receiving solutions to scientific or mathematical problems in their dreams. We have never had any such dream; in fact we get most of our scientific or mathematical insights when we are either in a semi-awake but conscious reverie or at the peak of our alertness. However, we on rare occasions we have had dreams which present mathematical matters. On the night between the 18th and 19th of Jan 2019 we had such dream. It was a long dream which featured human faces we do not recall seeing in real life: we forgot their role in the dream on waking. However, what we remembered of the dream was the striking and repeated appearance of the above equation along with its solutions for several . On waking, we distinctly recall seeing the cases of though there were many more in the dream. There was a degree of discomfort from the dream for in the groggy state of waking from it we knew that some of these solutions had slipped away. So, at the first chance we got, we played a bit with this equation this on our laptop. We should mention that we have not previously played with this equation and have given it little if any thought before: we glanced at it when we had previously written about the cakravala but really did not give it any further consideration then or thereafter. Hence, we were charmed by its unexpected and strong appearance in our dream. This equation is known as Mordell’s equation after the mathematician who started studying it intensely about a century ago. The equation itself was know before him to a French mathematician Bachet and is sometimes given his name. It has apparently been widely studied by modern mathematicians and they know a lot about it. As a mathematical layman we are not presenting any of that discussion here but simply record below our elementary exploration of it. These equations define a class of elliptic curves and by definition given the square term they are symmetric about the -axis (Figure 1). Since, we are here only looking at the real plane, the curve is only defined starting from where it cuts the -axis. From there on it opens symmetrically towards in the direction of the positive . 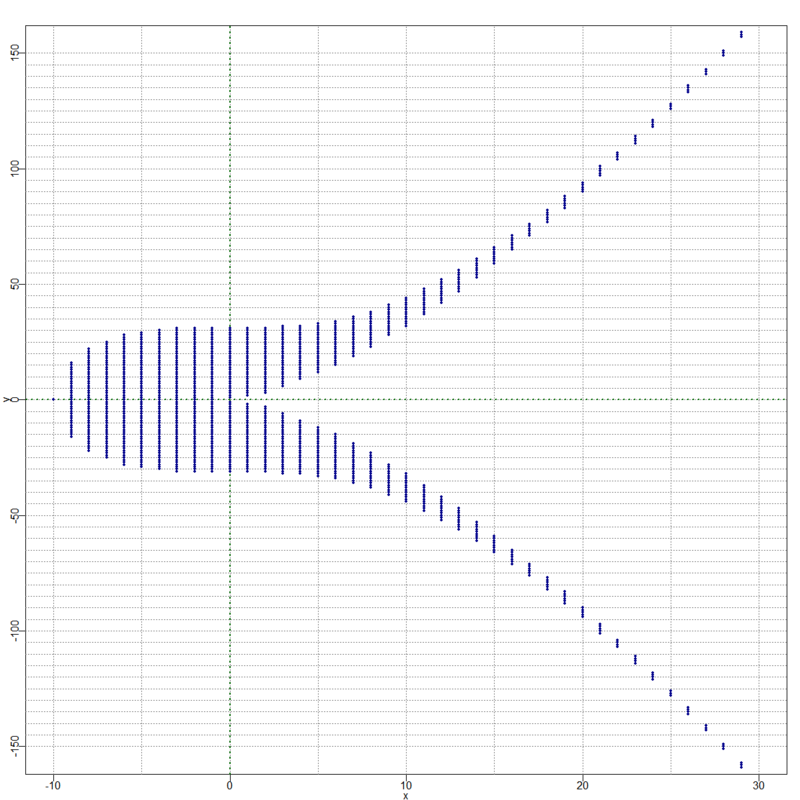 So, essentially we are looking for the lattice points which lie on this curve. Given the square term, we will get symmetric pairs of solutions about the -axis (Figure 1). 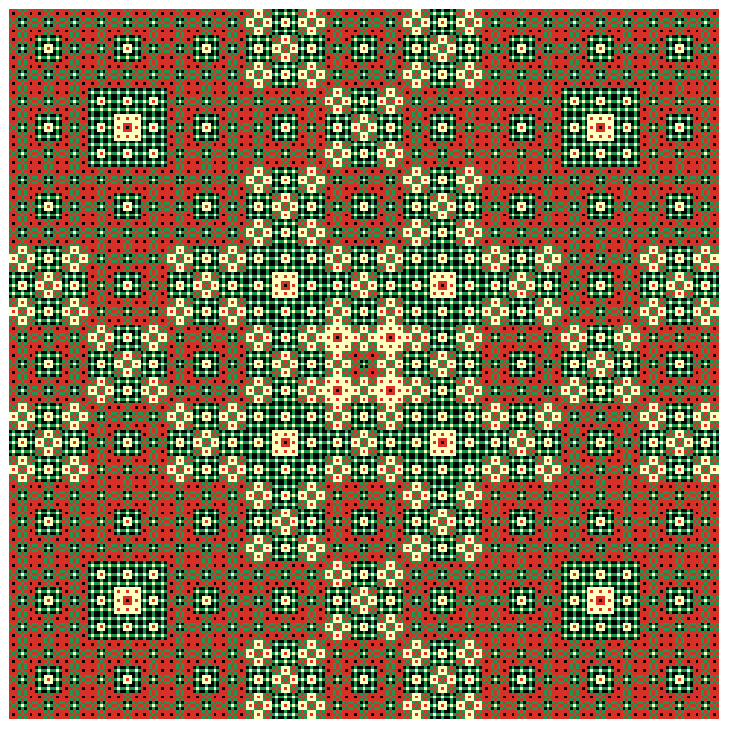 In geometric terms, it might be viewed as the problem of which squares and cubes with sides of integer units are inter-convertible by the addition of units. Mordell had pointed out about a century ago that these equations might have either no integer solutions or only a finite number of them. Let is consider a concrete example with : . One can get three trivial solutions right away: by setting we get . Similarly, setting , we get . Further, we see that if we get . 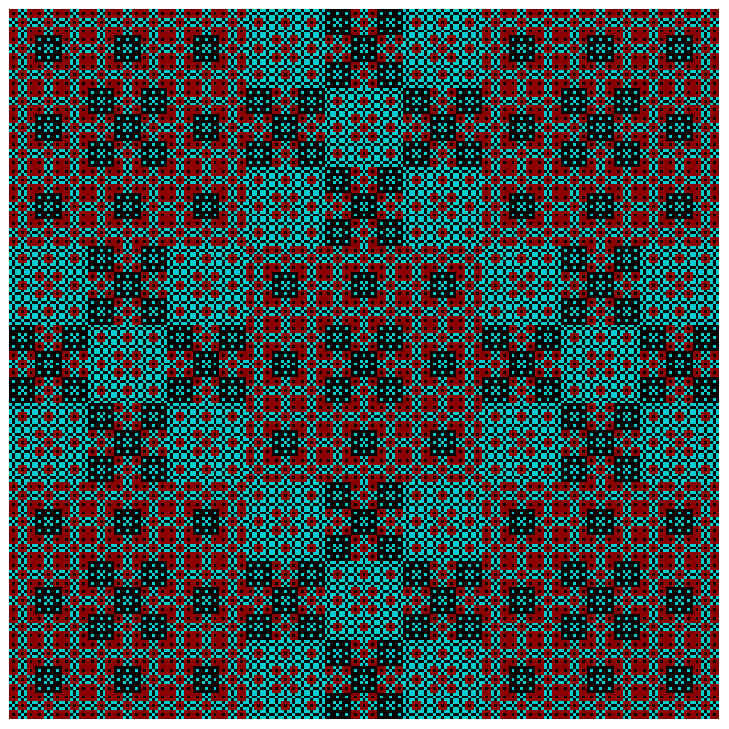 Thus, we can write the solutions as pairs: (-1,0); (0,1); (0, -1); (2,3); (2,-3): a total of 5 unique integer solutions. Can there be any more solutions than these? To get an intuitive geometric feel for this we first observe how these solutions sit on the curve (Figure 1). We notice that the 3 distinct ones are on the same straight line (also applies to their mirror images via a mirrored line). 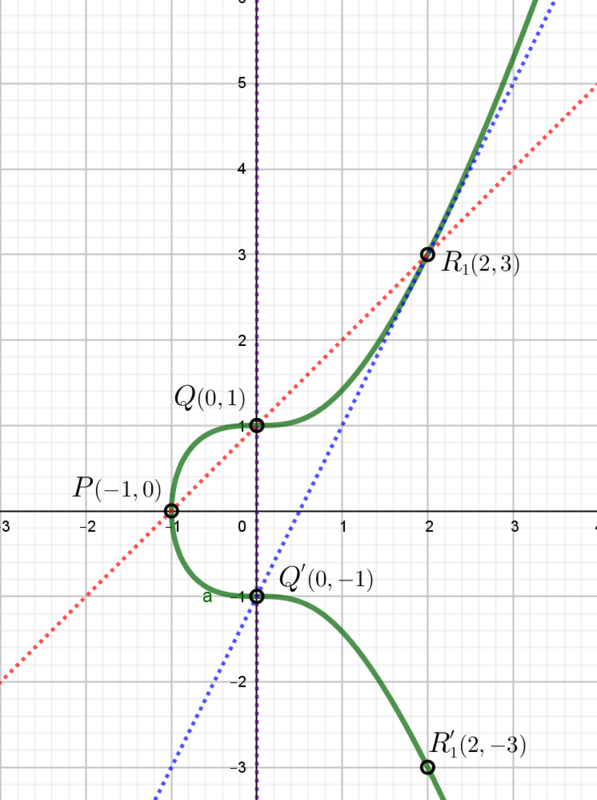 This is a important property of elliptic curves (being cubic curves) that allows us to understand the situation better. In Figure 2, we consider the curve in greater detail. We observe that if we have two integer solutions points and and we connect them we get the third one . 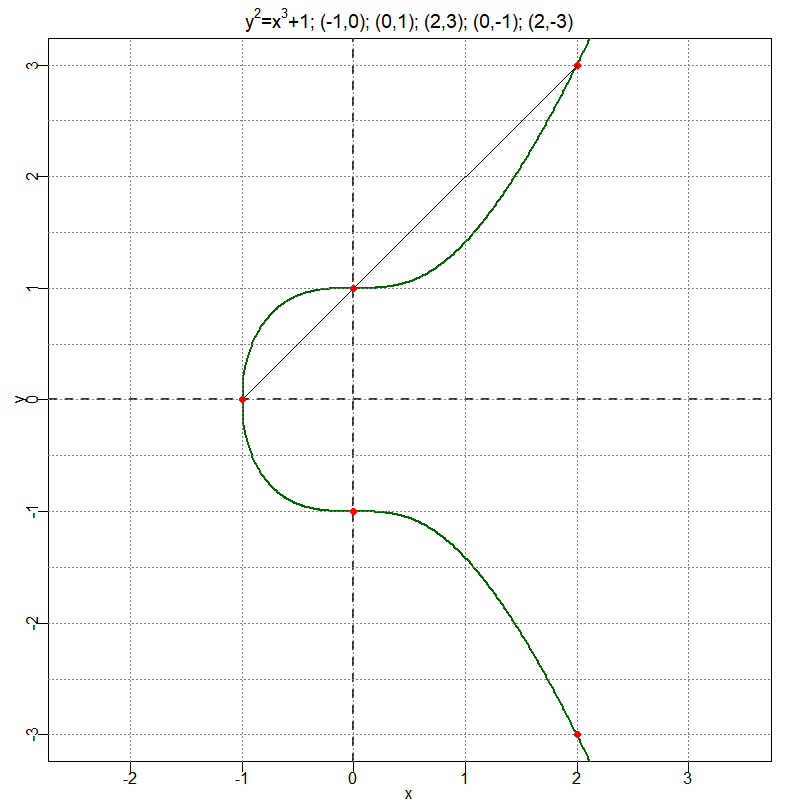 Thus, if we have two solutions, in this case the trivial ones, we can easily find the third one by drawing a line through them and seeing where it cuts the elliptic curve. The point where it cuts it gives a further solution. We also see from the figure that joining symmetric solutions like points , will not yield any further solutions because the resultant line will be parallel to the -axis. Thus, we might get an additional solution only if the slope of the line joining the 2 prior solutions is neither (coincident with the -axis) nor (parallel to -axis). Hence, we may ask: now that we have can we get a further solution? We can see that joining to yields a line that will never again cut the curve . Thus, we can geometrically see that there can be no more than the 5 above solutions we obtained. ; thus for the “new point” we get: . We simply get back indicating that there are no further integer solutions than the 5 we have. One may also see a parallel between this procedure of obtaining a third integer solution by joining two points and the process of obtaining a composite number by multiplying two prime numbers. If we know the two starting points it is easy to get the third but if we were to only know the third point for a large number getting its precursors would be a difficult task. This relates to the use of elliptic curves as an alternative for primes in cryptography (see our earlier note on the use of prime numbers in the same). We can then systematically explore the solutions for all . 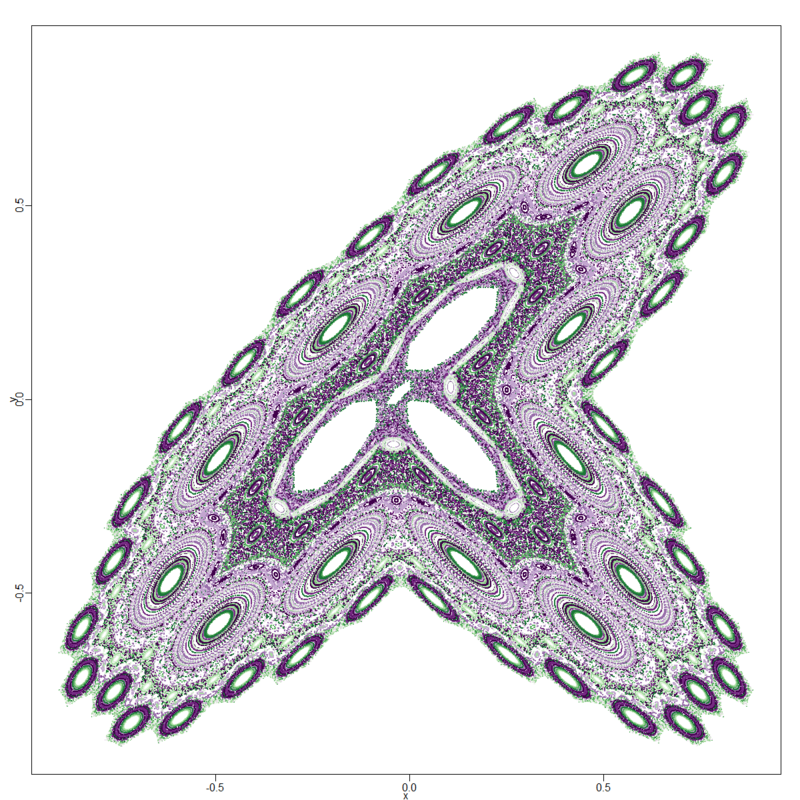 If we plot all solutions and zoom in close to origin we find a dense clustering of the solutions forming a swallow-tail like structure whose outline is an integer approximation of an elliptic curve (Figure 4). We further find that some have no integer solutions at all. There is a formal way to use modulos and factorization to prove this for particular . The sequence of for which no integer solutions exist can be computationally obtained and goes as: 6, 7, 11, 13, 14, 20, 21, 23, 29, 32… Figure 5 shows how the term of this sequence grows. 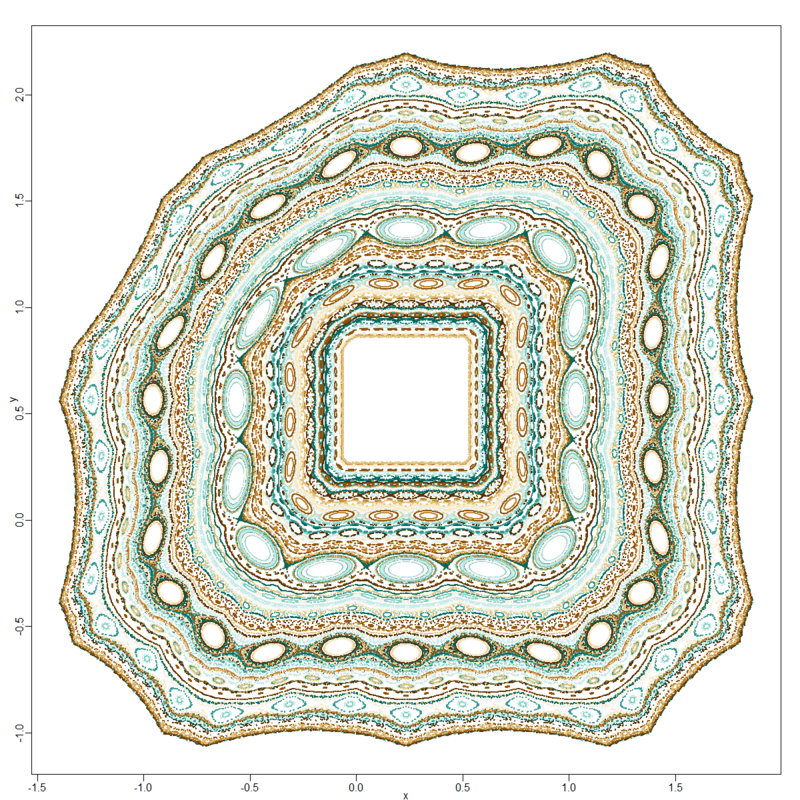 We find empirically that it appears to be bounded by or at least approximated by the shape of a scaled form of the logarithmic integral: . Whether this is true or what the significance of it may be remains unknown to us. 1) The most common number of solutions is 0. For this happens with a probability of 0.549, i.e. more than half the times there are no integer solutions for Mordell’s equation. The next most frequent number of solutions is 2. This happens with a probability of 0.306 in this range. These are the cases when you just have two symmetric solutions differing in the sign of their value. 2) An odd number of solutions is obtained only when is a perfect cube. This is because only in this case we get the unpaired solution of the form . The cubic powers of 2 are particular rich in solutions. E.g. yields 9 solutions: (-8,0); (-7,13); (4,24); (8,32); (184,2496); (-7,-13); (4,-24); (8,-32); (184,-2496). 3) If is a perfect square then for , and we will have at least 2 solutions: for we have ; for we have ; for we have . 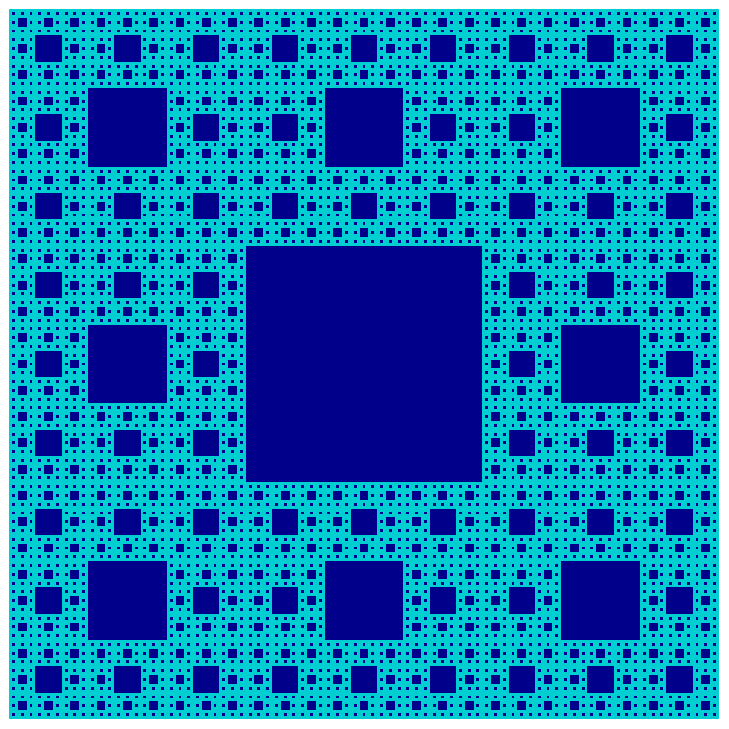 This would predict that, taken together, perfect square and their two immediate neighbors on either side would have a higher average number of solutions than an equivalent number of drawn at random in the same range. This is found to be the case empirically (Figure 7). The mean number of solutions of the square and their immediate neighbors is 4.108696 (red line in Figure 7) as opposed to the mean number of solutions of 1.522 (black line) for all . 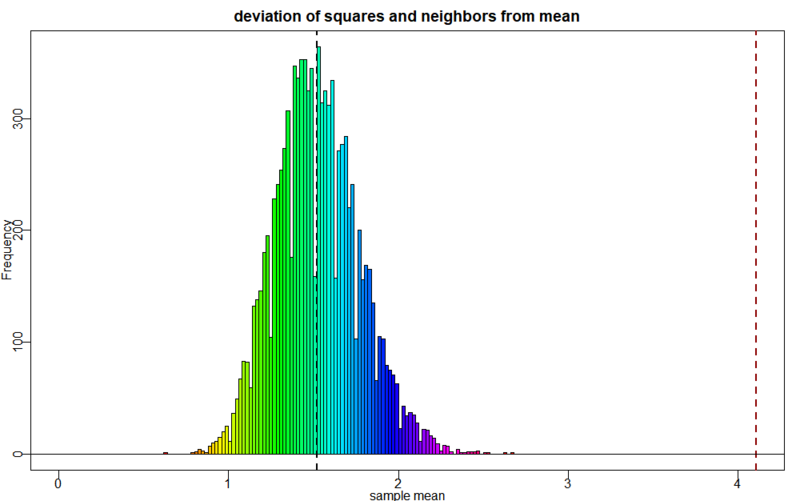 The former is 10.42 standard deviations away from the mean for equivalently sized samples drawn randomly from . 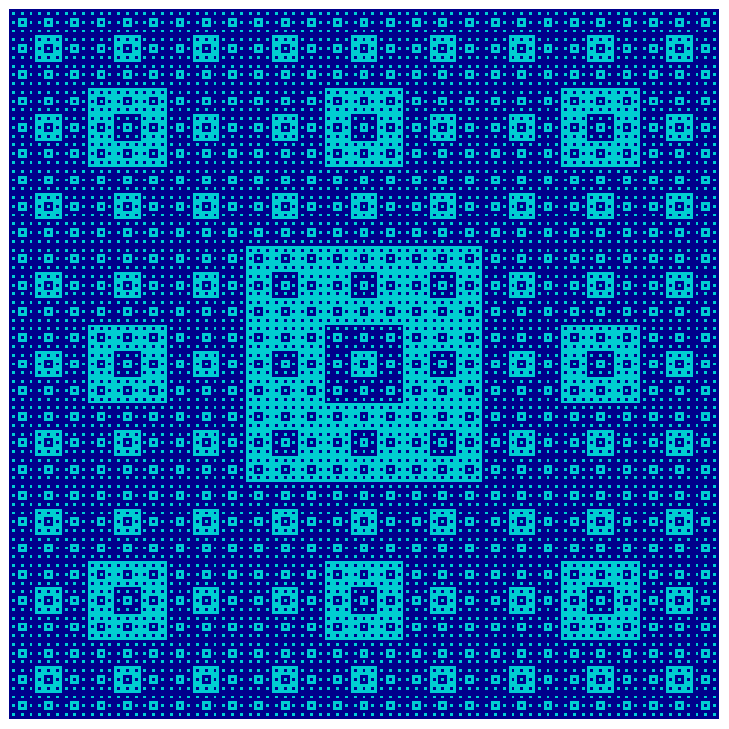 A square neighbor with a LCC is which has 8 cubic conjunctions leading to its 16 solutions: (-2,3); (-1,4); (2,5); (4,9); (8,23); (43,282); (52,375); (5234,378661); (-2,-3); (-1,-4); (2,-5); (4,-9); (8,-23); (43,-282); (52,-375); (5234,-378661). is an even more monstrous square neighbor with a LCC outside the range that we systematically explored. 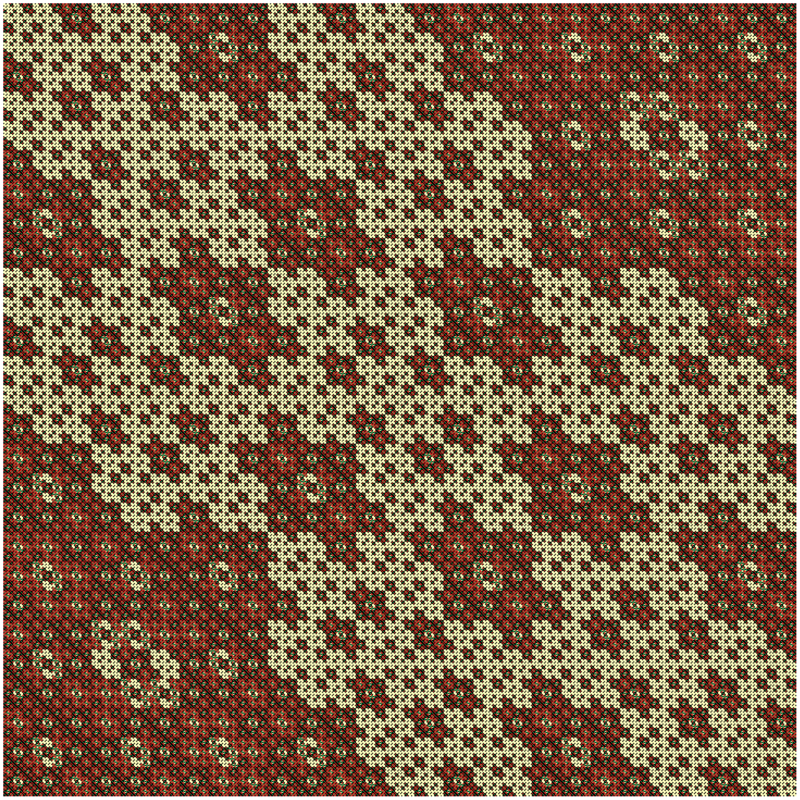 This number has a whopping 16 cubic conjunctions giving rise to 32 solutions: (-10,5); (-5,30); (-4,31); (-1,32); (4,33); (10,45); (20,95); (40,255); (50,355); (64,513); (155,1930); (166,2139); (446,9419); (920,27905); (3631,218796); (3730,227805); (-10,-5); (-5,-30); (-4,-31); (-1,-32); (4,-33); (10,-45); (20,-95); (40,-255); (50,-355); (64,-513); (155,-1930); (166,-2139); (446,-9419); (920,-27905); (3631,-218796); (3730,-227805). In my computational exploration of these elliptic curves I am yet to find any other that out does 1025. 5) While which are squares and square neighbors have at least 2 solutions guaranteed, in principle a non-square or non-square neighbor number can show a LCC and give rise to a large number of solutions. 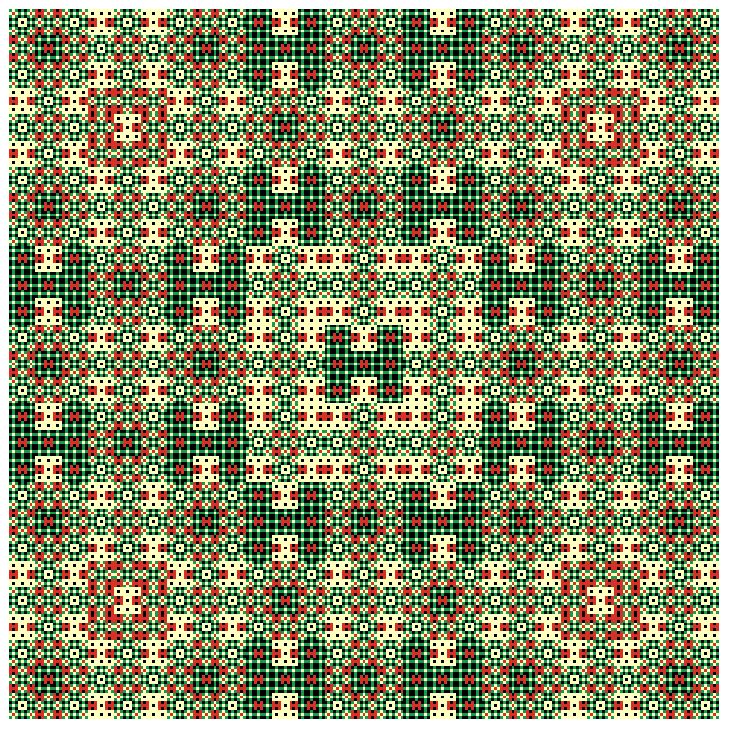 One such as which shows 9 cubic conjunctions to give 18 solutions: (-6,9); (-2,17); (3,18); (4,19); (12,45); (34,199); (48,333); (1362,50265); (93844,28748141); (-6,-9); (-2,-17); (3,-18); (4,-19); (12,-45); (34,-199); (48,-333); (1362,-50265); (93844,-28748141). also shows a similar LCC, again with 9 cubic conjunctions. Outside the range we systematically explored, we found to show a remarkable LCC with 14 conjunctions yielding 28 solutions: (-12,19); (-10,33); (-4,45); (3,46); (8,51); (18,89); (60,467); (71,600); (80,717); (170,2217); (183,2476); (698,18441); (9278,893679); (129968,46854861); (-12,-19); (-10,-33); (-4,-45); (3,-46); (8,-51); (18,-89); (60,-467); (71,-600); (80,-717); (170,-2217); (183,-2476); (698,-18441); (9278,-893679); (129968,-46854861). 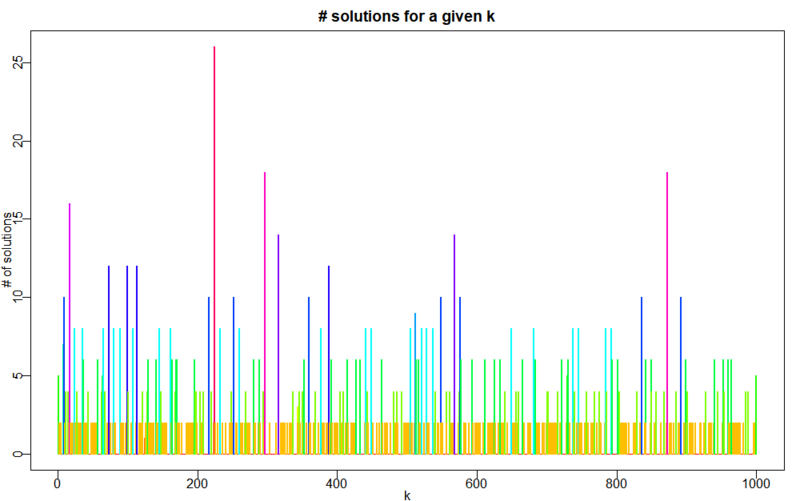 This is the second highest number of solutions we have seen for the Mordell’s equations we have studied. A complete version of this apolog will currently not be visible to the public. Things had cooled off a bit on the political front after the assassination of the Prime Minister Pratap Simha by a massed drone attack. On the personal front Vidrum had sort of come to terms with the mysterious disappearance of his lover Meghana. He was now ever more convinced that she had been killed by a marūnmatta. He had the vague sense of possible trouble in the future but for now his duties as a young physician kept him busy. He had set aside the anger and indignation that resulted from the disappearance of Meghana and was following the advise of his precocious junior and professor at the medical school, Vrishchika, to chart out an appropriate niche for himself. Thus, he was watching less cricket and spending his free time looking more closely at the relevant clinical data along the lines Vrishchika had suggested to him. While he initially found it boring, he soon felt he was seeing patterns he had never before seen in his life. This perked him up and he started putting in effort to try to understand them. In the process he was for the first time trying to read a wider array of literature with a more critical mind. Suddenly, it was dawning on him that several of the practices and larger framework of the modern medical practice itself was mostly not grounded in alleviating the problems of the patients. That afternoon Vidrum felt his mind crowded with less-comforting issues. Perhaps, deep within he had some foreboding that there was only a temporary lull in the troubles and that a great clash of men was waiting to happen in the future. Due to the company of his old friends Vidrum was moving away from the alluring but fallacious ideas of his other friends like Samikaran, Gardabh and Mahish. In fact it seemed as though they could no longer be counted as his friends, especially if the terminal life and death struggle between the dharma and rākṣasavāda was to play out as Lootika had witnessed in her dream. To add to this general background of thoughts, the experience with a patient he had to handle the previous day was playing on his mind for some reason – he was hardened to such sentiments but for some reason this case kept returning to his mind. It specifically raised a question which had always bothered him in the background – the thought of whether he had really been a success in life. He had faithfully followed what his parents had charted for him. After all the trials and tribulations he had been successful at that but it was not entirely clear to him if had truly met ‘success’. His parents were extremely proud of where he had reached in life but he was not entirely sure if that meant anything at all. On the other side his mind wandered with some happy expectation to the impending appointment he had early that evening. He had been invited to Indrasena and Vrishchika’s house for hanging out for the evening and dinner. Indrasena’s younger brother Pinakasena and his wife Shallaki were also on vacation with them for a few days. But then his mind wandered back to the issue of achievement when he thought of the people whom he was slated to visit that evening. Nevertheless, knowing that time was short he quickly made some lemonade and ṣaṭṭaka -s that he wished to take to his hosts to accompany the dinner they were spreading. What relationship exists between the 9 quantities from ? To solve this we must make some assumptions that Newton indicates in his work: 1) On an average the cows and fields are equivalent. That would mean that we can take each cow to eat the same amount daily and each field to have the same type and amount of grass . Grass, ungulates and fungi are in a complex relationship. Grass “hire” fungal symbionts to produce toxins like the ergot alkaloids to deter ungulates. There is some empirical evidence that grazing by ungulates triggers grass growth. So we get the assumption: 2) The grass is not at standstill while being grazed daily but is growing back at a daily rate of . At the end of day 2 we get: and so on. There seems to have been a error in Newton’s original copy of this problem which he corrected late in his life. A question that comes to us is: Is there some easy algorithm for generating such valid integer nonads and is there some pattern to them? We have discussed our explorations of this map at some length before. At that point we also discussed our discovery of certain generalizations of this class of maps. In course of the quest for the generalized Lozi-like maps, we discovered another generalization remarkable for the diversity of forms it produced. We held back from presenting it because we wished to investigate its geometry further. As a result we are now able to explain the basic geometric determinants of the map; however, there are other aspects that still remain mysterious to us. Hence, we are presenting this map with whatever understanding we could arrive at along with the issues that are still open questions for us. They are maps of great beauty; hence, they are also worth beholding for the sake of their aesthetics. Here are real parameters: is in the range (see below for explanation), while we explored primarily in range as this is the range where there is higher tendency for the map to yield chaotic attractors. If we take the first definition then the map is bilaterally symmetric about the axial line . It we take the second definition it is similarly symmetric about the axis . For the below discussion we refer only to the first definition because the second one shows comparable behavior with change in signs of some of the parameters. 1) The most important determinant of the geometry of the attractor is sum of the parameters . When are closer to 1 and where are mutually prime integers, we get a p-ad structure in the attractor (e.g. Figure 1). 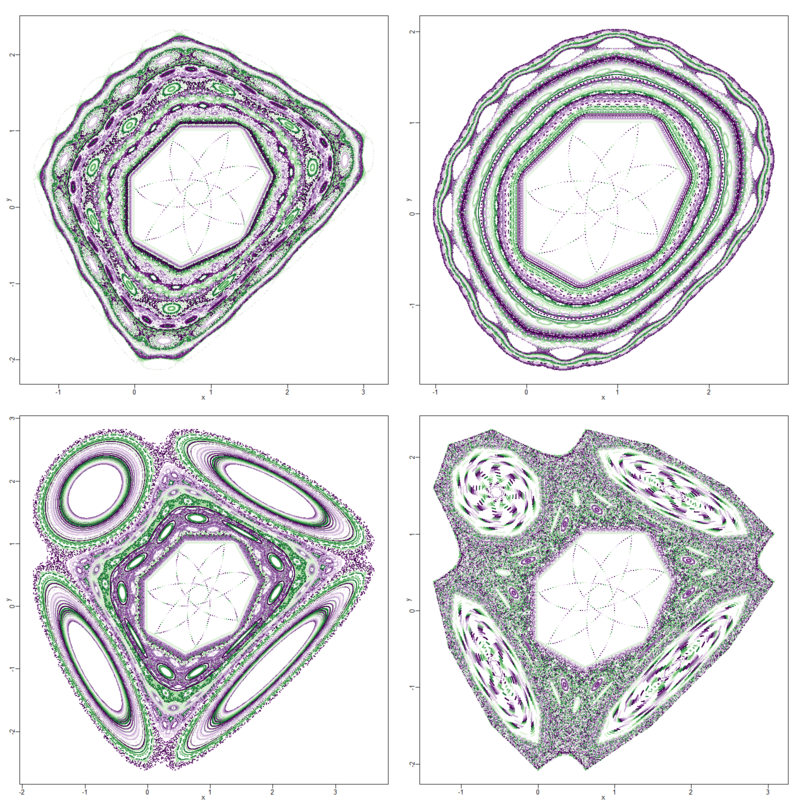 In Figure 1, , and takes successively, by row, the following 4 pairs of values (-0.5450419, 0.1); (-0.2450419; -0.2); (-0.7450419, 0.3); (-0.9450419; 0.5) . In each case . 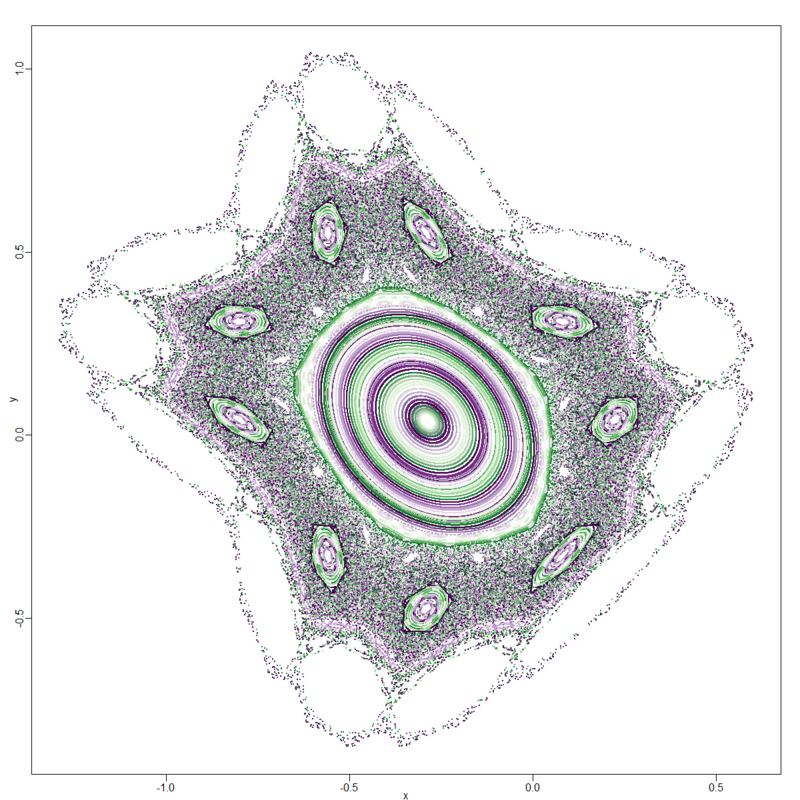 This determines the central heptad structure but the rest of the attractor shows considerable variability that cannot be explained in a straightforward way from these parameters. If and then there is greater tolerance for the range of values can take. With we get a nonad structure even though is relatively low. When and the p-ad structure in the attractor tends to be retained (Figure 3). In this case is close to ; thus, we get a core with a heptad structure. 2) For low values of both or at least , including when they are below 0 and we see a loss of the p-ad structure or a flattening of the attractor along the axis of symmetry from the top left side (Figure 5). In both panels ; . In the left panel and the expected pentad structure is retained. In the right panel ; we notice that the pentad structure has been lost with flattening along the axis of symmetry. 1) For example, In Figure 3 in addition to the core heptad one can see additional harmonics like a 11-ad, 18-ad and 29-ad structures. What is the explanation for them? In the previous examples of chaotic maps we could explain higher harmonics based on other whose might lie close to the primary cosine. However, in this case the 11-ad, the 18-ad and 29-ad correspond to no such cosines. Hence, their emergence remains a mystery. 2) Further, there is an effect of the starting , which can result in the appearance of a n-ad structure independently of the cosine principle (Figure 6). Figure 6. The effect the initial points. In both the above cases the four parameters are respectively, -0.567115129642189, -0.761931293738961, -0.347582505706949, -0.069076271019876. However, the left panel was initialized with a circle of radius 0.9 and the right panel was initialized with a circle of radius . 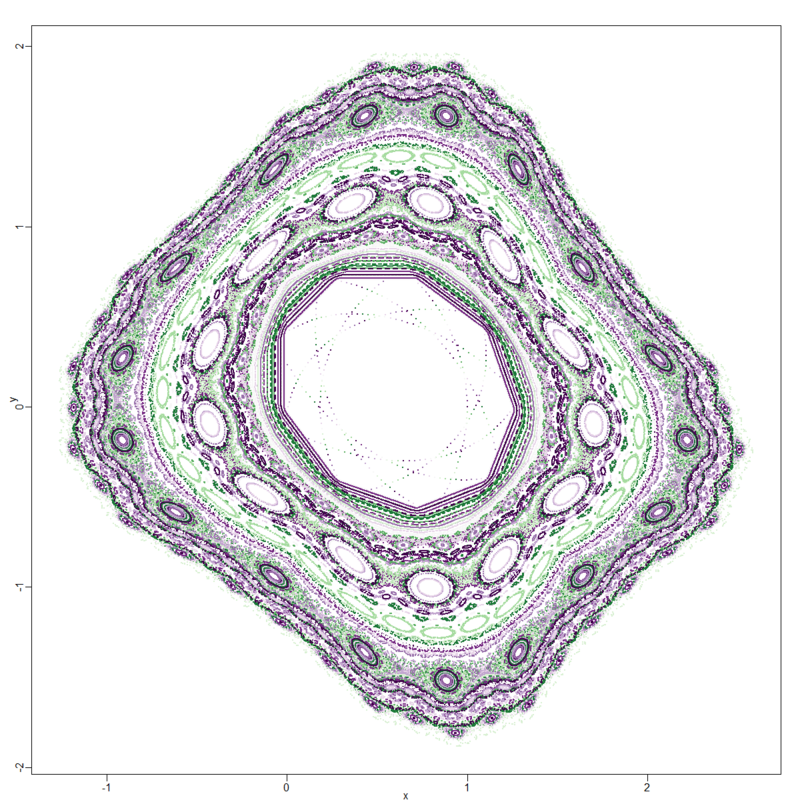 Only in the second case we see the emergence of a heptad structure, which cannot be accounted for by the sum of . The role of the starting in generating n-ad structures is another open question. 1) We set as the starting point. 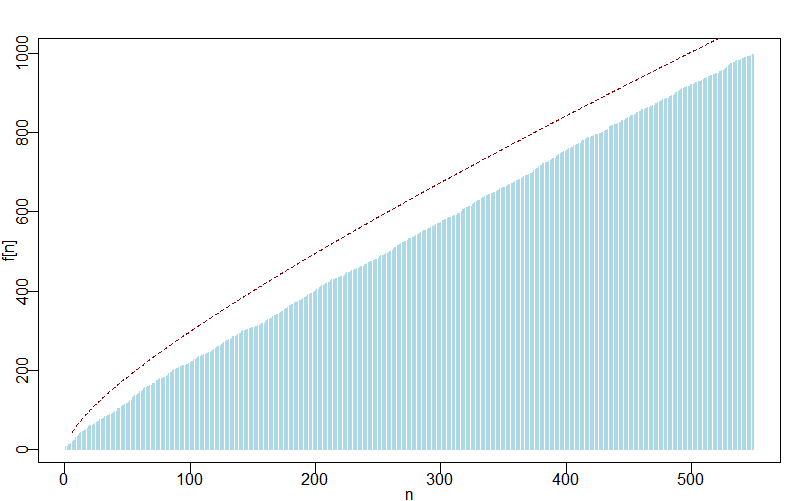 2) We then randomly generated a set of parameters in the range . 3) For each such set we allowed to evolve for 1000 iterations under the map. If the evolution resulted in the divergence to or convergence to one or few point attractors, then we discarded those parameters. 4) A heuristic for chaos is that very small differences in the initial conditions can result in very different end results upon evolution under the map after a certain number of iterations. Hence, for those parameters which survived the above filters we tested if a second , which differed from the first by in each coordinate diverged from the evolutionary path of the original after the same number of iterations. 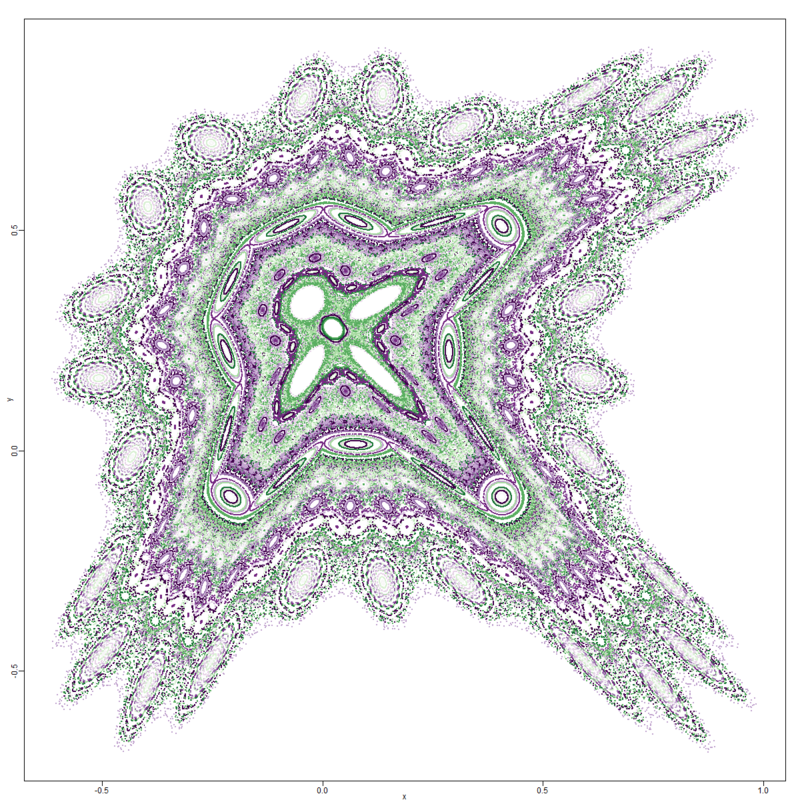 If it did so, the parameter set was retained as it was the sign of being on a chaotic attractor. 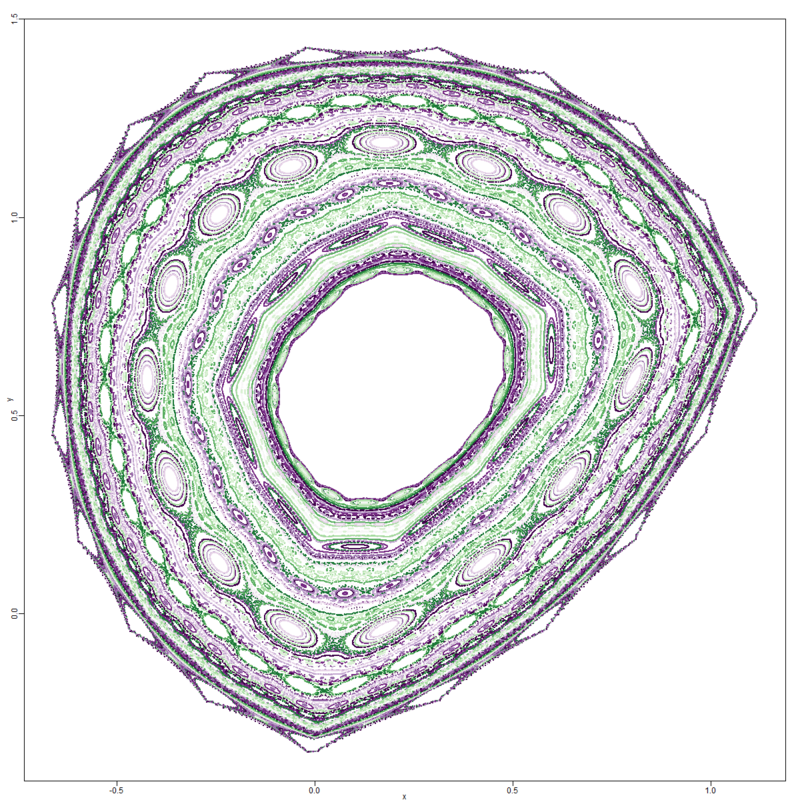 5) These surviving parameter sets were then explored more fully by studying the evolution of 200 equally spaced points on the circle for 2000 iterations of the map. We present below few examples of attractors emerging from the above procedure with parameters listed in order from to . 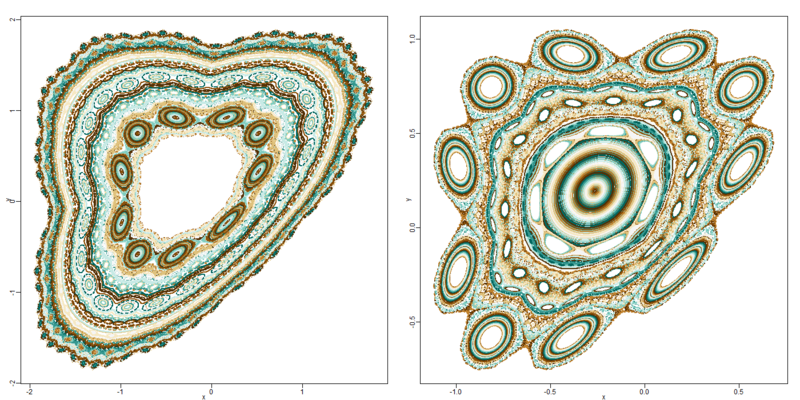 This attractor assumes of the form reminiscent in some ways of the gingerbread man seen in the classical Lozi attractor. The gingerbread man has a “heart” in the form a five-lobed structure with a ellipse within it. 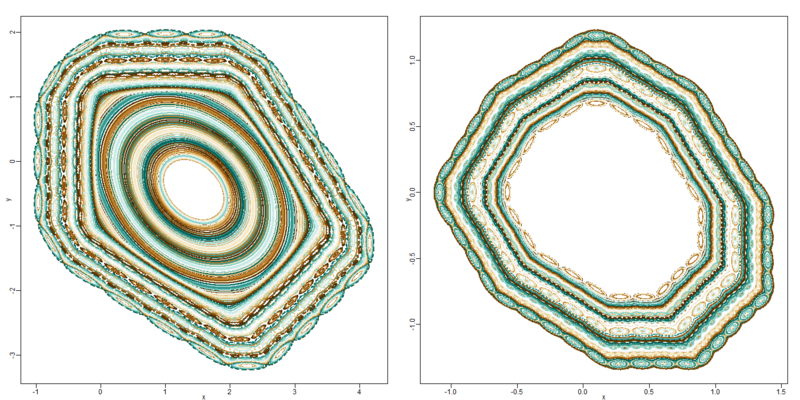 This attractor has parallels to the previous one in being somewhat like the gingerbread man with 4 hands. This attractor takes the form of a fish or some crustacean naupilus larva. 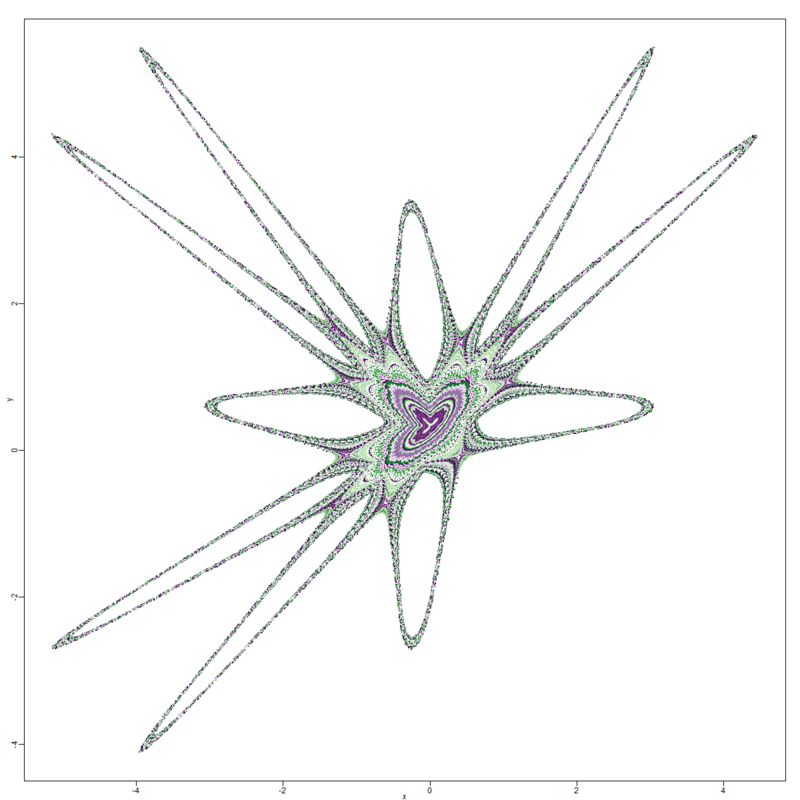 This attractor looks somewhat like an echinoderm larva. 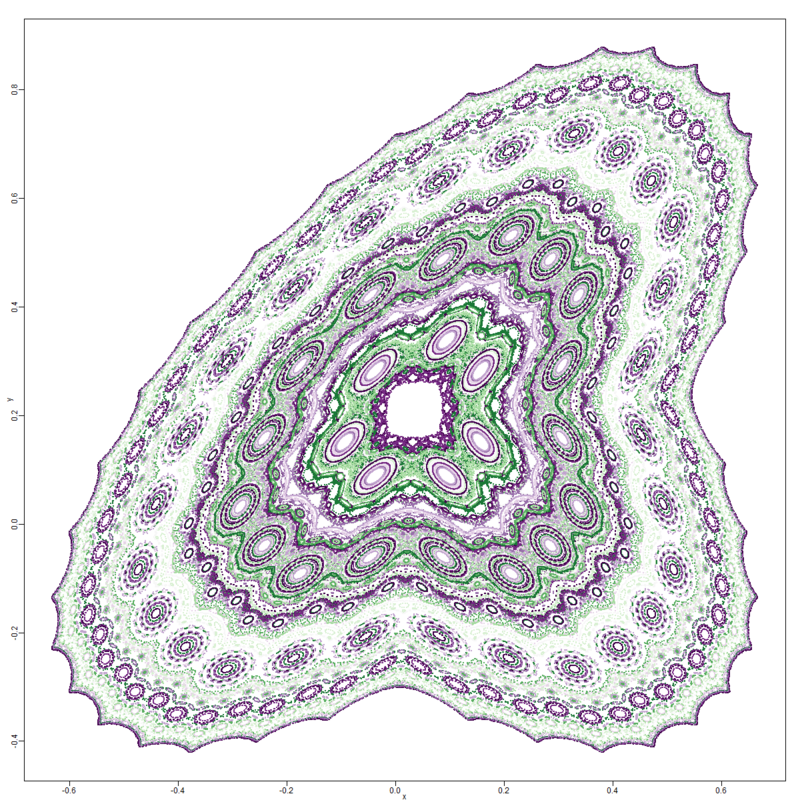 This is a representative of a prevalent type of attractor generated by this map that may be termed the “Sombrero hat” type. 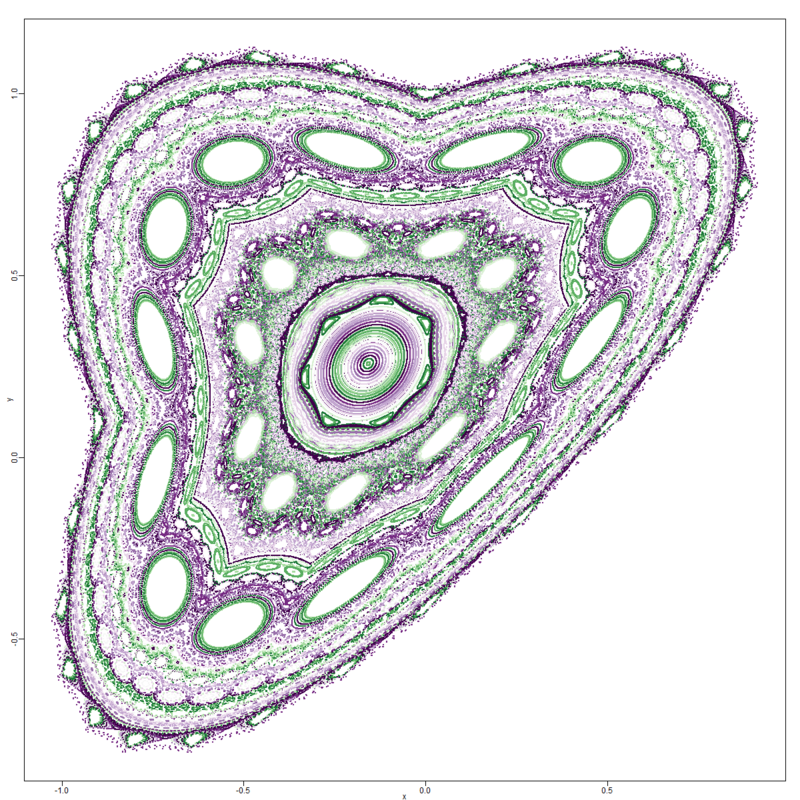 The central heptad structure in this attractor is a mystery because it is not explicable by the cosine conditions above-presented . 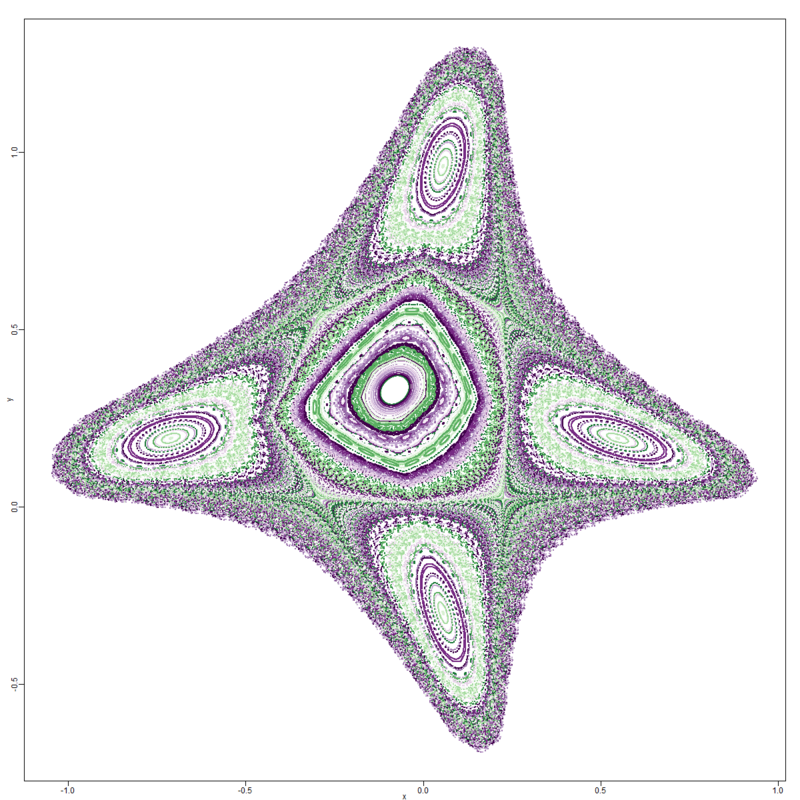 This form of the attractor resembles the butterfly attractor generated by the square-root modification of the Lozi map that we had described earlier. Another version of the “Sombrero hat” type. For this attractor the radius of the circle was changed from 0.3 to 1, though it is stable and similar at the former value too. It vaguely resembles some Cambrian animal. 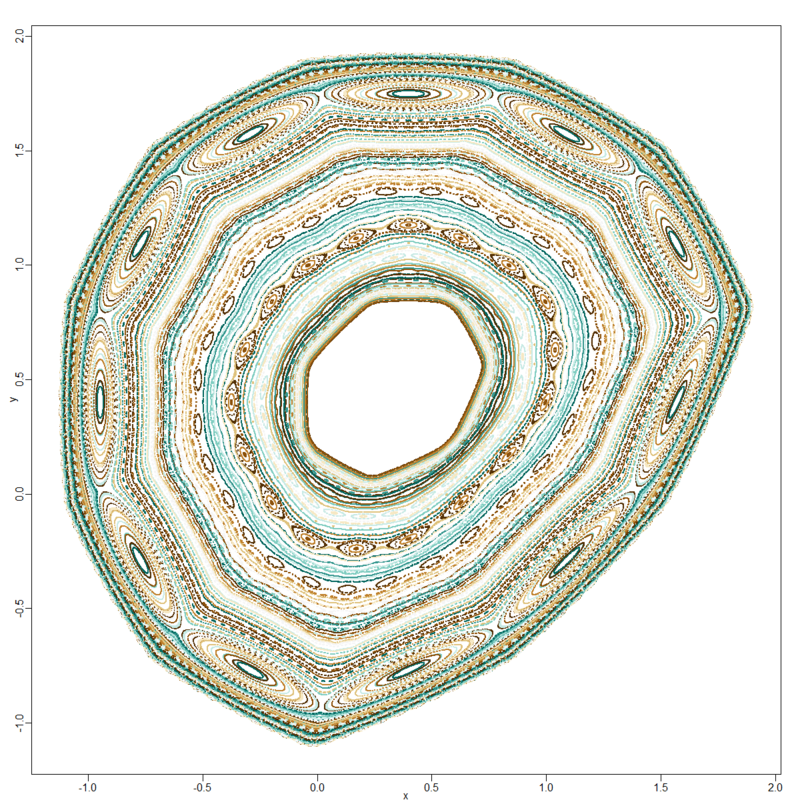 This attractor assumes a bun-shaped morph that is seen quite often under these maps. An explanation for the multiple harmonics of this attractor remains as yet mysterious to us. Another Sombrero hat type form. 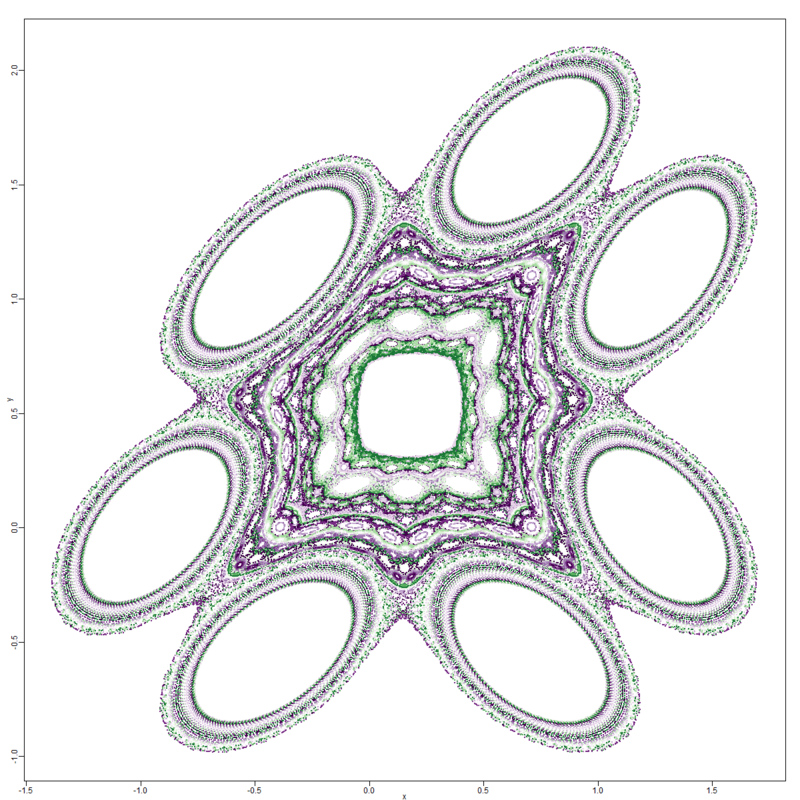 The radius of the circle was changed from 0.3 to .4 for this attractor. How one accounts for the central pentagonal zone of restriction and the triad of octagonal restriction zones around it remains mysterious. Here the radius of the circle was changed from 0.3 to 0.31. 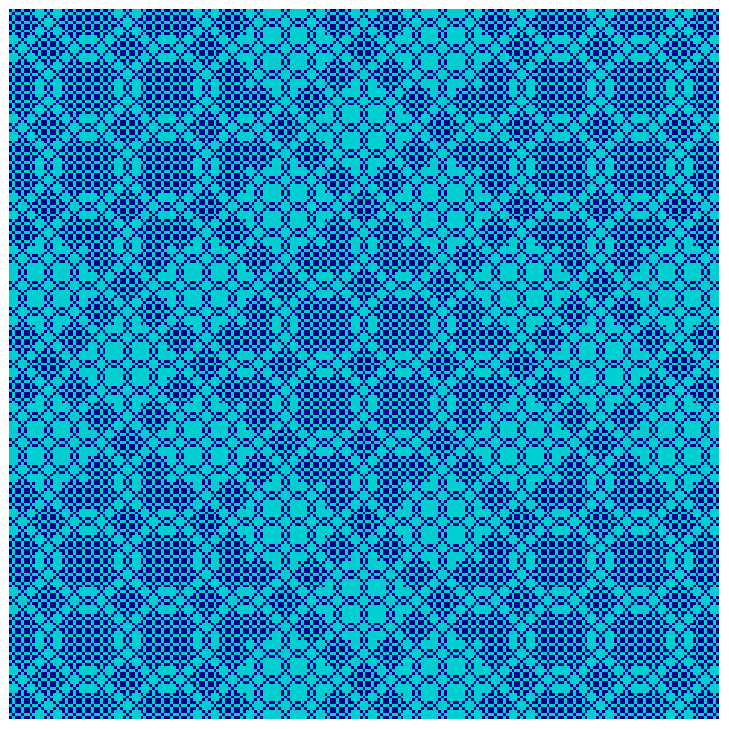 It shows a central pentad surrounded by 9 further pentads. An explanation for the emergence of these pentads and the 9 fold harmonic however remains elusive.